In the early days of computing you could only run one program at a time on a PC. This meant if you wanted to run 10 programs at once you needed 10 computers. Then bit by bit multitasking made its way from mainframes and Unix to PCs, which allowed you to run quite a few programs at a time. Doing this meant you could run all 10 programs on one computer and this worked quite well. However it was still quite a high overhead since each program used a lot of memory and switching between them wasn’t all that fast. This lead to the idea of multi-threading where you ran very light weight tasks inside a single program. These used the same memory and resources as the program they were running in, so switching between them was very quick and the resources used adding more threads was very minimal. Think about how this affects you if you are building a web server. You want to basically run your programs on the web server and consider if you are running in the cloud. If you were single process then each web user running your app would have a separate VM to handle his requests and he would interact with that VM. There would be a load balancer that routes the users requests to the appropriate VM. This is quite an expensive way to run since you typically pay quite a bit a month for each VM. You might be surprised to learn that there are quite a few web applications that run this way. The reason they do this is for greater security since in this model each user is completely separated from each other since they are really running against separate machines. The next level is to have the web server start a separate process to handle the requests for a given user. Basically when a new user signs on, a new process is started and all his requests are routed to this process. This model is typically used by applications that don’t want to support multi-threading or have other concerns. Again quite a few web applications run this way, but due to the high resource overhead of each process, you can only run at best a hundred or so users per server. Much better than one per VM, but still for the number of customers companies want to use their web site, this is quite expensive. The next level of efficiency is to have each new user that signs on, just start a new thread. This is then way less overhead since you use only a small amount of thread local storage and switching between running threads is very quick. Now we are getting into have thousands of active users running off each web server. This isn’t the whole story. The next step is to make your application stateless. This means that rather than each user getting their own thread, we put all the threads in a common pool. Then when a request for a user comes in, we just use a free thread from the pool to process the request. This way we don’t keep any state on the server for each user, and we only need the number of threads to be able to handle the number of active requests at a given time. This means while a user is thinking or reading a response, they are using no server resources. This is how you get a web applications like Facebook that can handle billions of users (of course they still use tens of thousands of servers to do this). These techniques aren’t only done in the operating system software, but modern hardware architectures have been optimized for these techniques as well. Modern server CPUs have multiple cores which are very efficient at running multiple threads in parallel. To really take advantage of the power of these processors you really need to be a multi-threaded application. 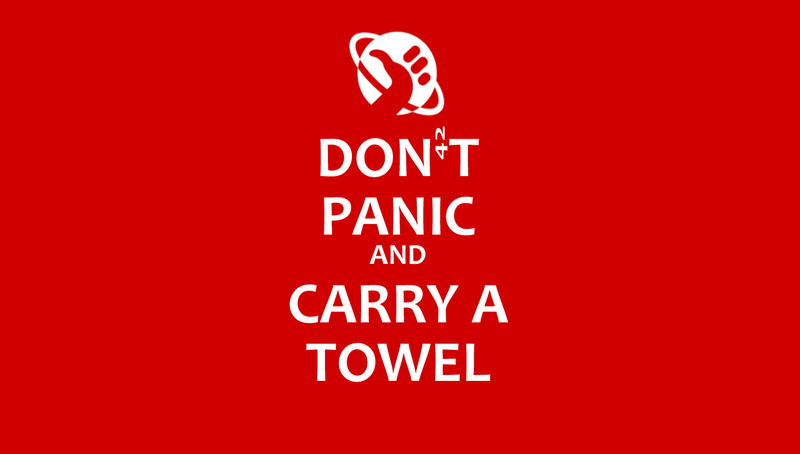 As Sage 300 moves to the cloud, we have the same concerns. We’ve been properly multi-process since our 32-Bit version, back in the version 4 days (the 16-Bit version wasn’t really multi-process because 16-Bit Windows wasn’t properly multi-process). We laid the foundations for multi-threaded operation in version 5.6A and then fully used it starting with version 6.0A for the Portal and Quote to Orders. Since then we’ve been improving our multi-threading as it is a very foundational component to being able to utilize our Business Logic Views from Web Applications. If you look at a general text book on multi-threading it looks quite difficult since you are having to be very careful to protect the right memory at the right time. However a lot of times these books are looking at highly efficient parallel algorithms. Whereas we want a thread to handle a specific request for a specific user to completion. 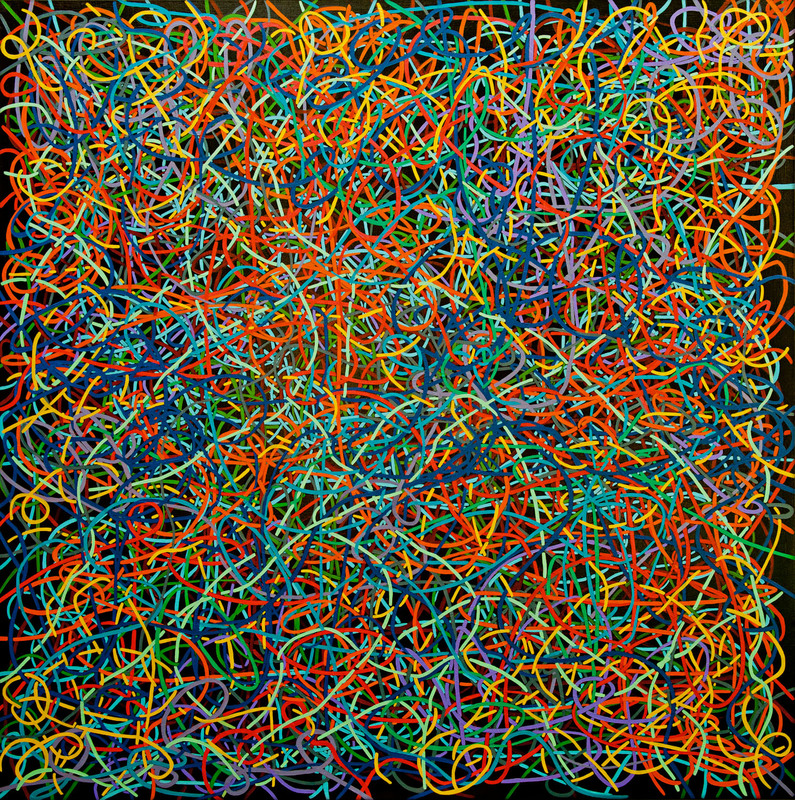 We never use multiple threads to handle a single request. From an API point of view this means each thread has its own .Net session object and its own set of open Sage 300 Business Logic Views. We keep these cached in a pool to be checked out, but we never have more than one thread operating on one of these at a time. This then greatly simplifies how our multi-threading support needs to work. If you’ve ever programmed our Business Logic Views, they have had the idea of being multi-threaded built into them from day 1. For instance all variables that need to be kept from call to call are stored associated with the view handle. There are no global variables in these Views. Further since even single threaded programs open multiple copies of the Views and use the recursively, a lot of this support has been fully tested since it’s required for these cases as well. For version 5.6A we had to ensure that our API had thread safe alternatives for every API and that any API that wasn’t thread safe was deprecated. The sort of thing that causes threading problems is if an API function say just returns TRUE or FALSE on whether it succeeds and then if you want to know the real reason you need to check a global variable for the last error return code. The regular C runtime has a number of functions of this nature and we used to do this for our BCD processing. Alternatives to these functions were added to just return the error code. The reason the global variable is bad, is that another thread could call one of these functions and reset this variable in between you getting the failed response and then checking the variable. If you’ve worked with our Views you will know that they are quite state-full. We can operate statelessly for simple operations like basic CRUD operations on simple objects. However for complicated data entry (like Order Entry or Invoice Entry) we do need to keep state while the user interacts with the document. This means we aren’t 100% stateless at this point, but our hope is that as we move forwards we can work to reduce the amount of state we keep, or reduce the number of interactions that require keeping state. Fortunately testing tools are getting better and better. We can test using the Visual Studio Load Tester as well as using JMeter. Using these tools we can uncover various resource leaks, memory problems and deadlocks which occur when multiple threads go wrong. Static code analysis tools and good old fashioned code reviews are very useful in this regard as well. As we progress the technology behind Sage 300, we need to make sure it has the foundations to run as a modern web application and our multi-threading support is key to this endeavor. We hold a developer’s exchange (DevEx) every couple of weeks where one of our developers volunteers to present to all the other developers in our office. This past week I presented at the DevEx on what all the core DLLs in our Sage 300 runtime folder do. I thought this might be of interest for a wider audience so here are the gory details. Our marketing supplied architecture diagram is the following which highlights our three tiers and hide a lot of the details of how the object repository, APIs and supporting services are implemented. I’ve blogged previously on our Business Logic Views. In this article I’m going to go into more detail on all the DLLs that provide the framework to support all of this. If you are an ISV developing Sage 300 SDK applications or have worked for Sage on the 300 product then you will have had to encounter a number of these DLLs. I’m only looking at a subset of current DLLs, and I’m not looking at all the DLLs that support older technologies that are still present to maintain compatibility with add-ons. A4wcompat.dll: We created this DLL back when we did a native port of the Sage 300 Views for Linux. This DLL isolates operating system differences that need more than some clever #defines. A big part of this is the thread and process synchronization and locking support. Even though we never released the native Linux version, this isolation of operating system dependent parts had made adding multi-threading support, 64 bit support and Unicode support easier. A4wmem32.dll: In 16 bit Windows, the built in memory management was really slow, so everyone used their own. Now this DLL uses the Windows and C default memory management, but is still important for global memory that needs to be shared across processes. Originally this was done through the data segment of a fixed DLL, but now is done through memory mapped files. A4wlleng.dll: This is just a language DLL that holds some lower level error messages used by System manager. A4wsqls.dll: This is the SQL Server database driver (there is also a4worcl.dll for Oracle and a4wbtrv.dll for Pervasive.SQL). This is dynamically loaded based on the type of database you are connecting to. For more on our database support see this article. Cato3msk.dll, cato3dat.dll: The cato3 DLLs are the old CA common controls. We don’t use these in our UIs anymore, but cato3msk.dll provides our mask processing that is used by the Views. Similarly we don’t use this date control, but do use a routine here to format dates in error messages correctly. A4wroto.dll: This handles the loading of the various View DLLs as well as the various UIs we’ve used in the past. It loads the roto.dat files and handles loading the right DLLs when View subclassing is going on or stub Views need to be used. A4wsem.dll: This handles the locking of the semaphor.bin file. It allows processes to lock the company database, an application or the whole site. It also handles application specific cross workstation locking needs. A4wrv.dll: This is the main DLL API entry point for the Views. It manages all the calling of the Views and handles other tasks like sending the calls for macro recording. For more on our View interfaces see this article. A4wapi.dll: This is quite a hodge-podge of services for the Views like revision lists, error reporting and such. It also has support routines for the older CA-Realizer UIs. This is quite a big DLL and has most of our C level API in it. A4wrpt.dll: This is our interface to Crystal Reports, it started as our interface to CA-RET then was converted to Crystal using their CRPE DLL interface, then converted to Crystal’s COM interface and now uses Crystal’s .Net Interface. A4wprgt.dll: This DLL handles replicating the system database tables into the various company databases when needed. A4wmtr.dll: This is our meter DLL for long running processes. It can either put up a meter dialog or just report back to the caller, the current status and percent complete. It also provides the API for cancelling long running processes. 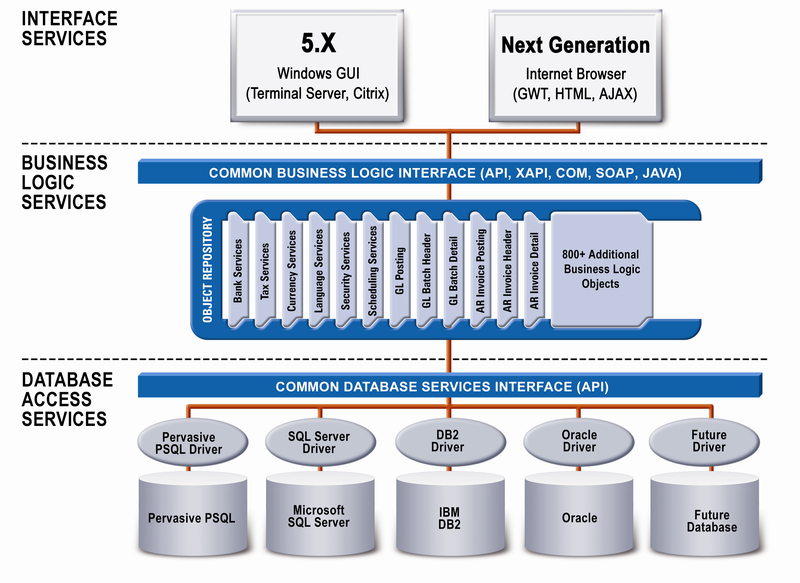 The next level are some of the DLLs that make up our Java, COM and .Net interfaces. There is a bit of complexity here due to how our previous web deployed system worked. Here we could communicate back to the server originally using DCOM and then later with .Net Remoting. The .Net Remoting layer provides both the communications layer for this web deployed mode and also acts as our .Net API. Depending on how you create your original session will configure which actual DLLs are used and which are calling conventions are used. A4wapiShim.dll: This is the C side of our Java JNI layer. It talks to all the lower level DLLs to get its work done. Sajava.jar: This is the Java side of our Java JNI interface. This allows Java programs to easily call Java classes to interface to our Business Logic Views. For more on this interface see this article. A4wcomsv.dll: This is the main workhorse for the COM and .Net APIs. It does all the heavy lifting and interfacing to the core DLLs. Accpac.Advantage.COMSVR.Interop.dll: This just performs the .Net to COM transition which is created by the MS tools. Accpac.Advantage.Server.dll: Server side of the .Net API, handles the .Net Remoting requests if remotely called or just passes through otherwise. Accpac.Advantage.Types.dll: Defines all the various types we use in our .Net API. Accpac.Advantage.dll: This is the main external interface for our .Net API. For more on our .Net API see the series of articles starting with this one. A4wcomexps.dll: Used when the VB UIs are going to talk .Net Remoting, this DLL is inside a4wcomex.cab. 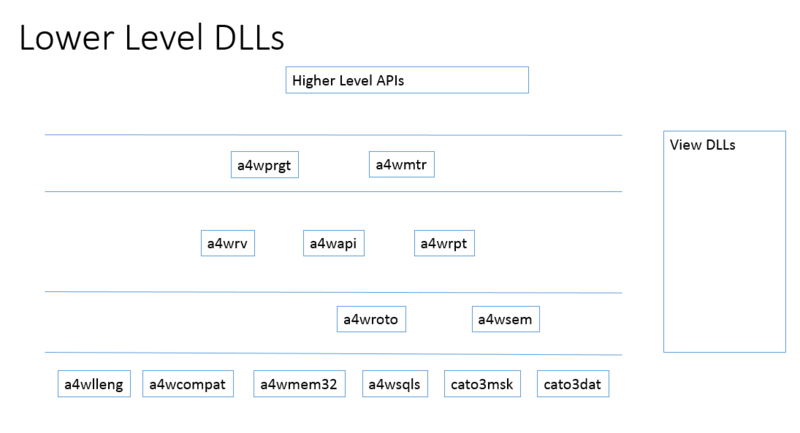 A4wcomex.dll: The main entry point for the COM API. There are many more DLLs in the Sage 300 runtime, but most of the others are for obsolete APIs like the xapi, the older a4wcom COM API, the cmd API, the icmd API, etc. There are other important ones like to do with Database Setup, but these are the main ones used when you talk to the Business Logic through one of the main popular APIs. For anyone interested this should give you a good idea of what the main DLLs in the runtime folder do. And give you an idea of how the various services in Sage 300 ERP are layered. Right now we have our nephew Ian living with us as he takes a Lighthouse Labs developer boot camp program in Ruby on Rails and Web Programming. This is a very intense course that has 8 weeks instruction and then a guaranteed internship of at least 4 weeks with a sponsoring company. A lot of this is an immersion in the current high tech culture that has developed in downtown Vancouver. This corresponds with myself working to expand the Sage 300 ERP development team in Richmond and our hiring efforts over the past several months. This article is then based on a few observations and experiences around these two happenings. Sage 300 ERP has been around for over thirty years now and this has caused us to have quite a few generations of programmers all working on the product. Certainly over this time the various theories of what a high tech office should look like and what a talented programmer wants in a company has changed quite dramatically. As Sage moves forwards we need to change with the times and adopt a lot of these new ways of doing things and accommodate these new preferred lifestyles. Generally people go through three phases of their career, starting single, no kids, renting to transitioning to married, home ownership and eventually kids to kids leaving home and considering retiring. Of course these days there can be some major career changes along the way as industries are disrupted and people need to retrain and reeducate themselves. Every office needs a good mix, to build a diverse, energetic and innovative culture, which has experience but is still willing to take risks. When I started with Accpac at Computer Associates, we were largely a cube farm perhaps not to dis-similar to the picture below. The ambition was to have as much privacy as possible which usually translated to high cube walls, other barriers and the ambition to one day move into an office. At the time Microsoft advertised that on their campus every employee got an office, so they could concentrate and think to be more effective at their work. I visited the Excel team at this time and they had two buildings packed with lots of very small offices which led to long narrow claustrophobic hallways. A lot has changed since then. Software development has much more adopted the Scrum/Agile model where people work together as a team and social interactions are very important. Further as products move to the cloud, the developers need to team up with DevOps and all sorts of other people that are crucial for their product’s success. Now most firms adopt more open office approach. There are no permanent offices, everyone works together as a team. There is a lot of debate about which is better. 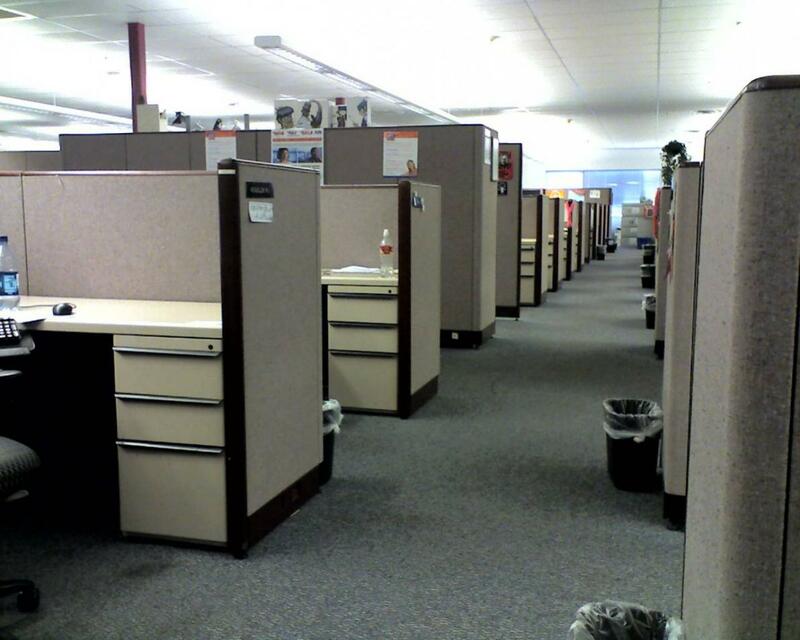 People used to more privacy of offices and cubes are loathe to lose that. People that have been using the open office approach can’t imagine moving back to cubes. Also with more people working a percentage of their time from home, a permanent spot at the offices doesn’t always make sense. When I started with CA the office was located in town near Granville Island. This was a great location, central, many good restaurants, and easily accessible via transit. Then we moved out to Richmond to a sprawling high tech park like many of the similar companies in the 90s. These were all sprawling landscapes of three story office buildings each one with a giant parking lot surrounding it. All very similar whether in Richmond, Irvine, Santa Clara or elsewhere. Now the trend is reversing and people are moving back to downtown. 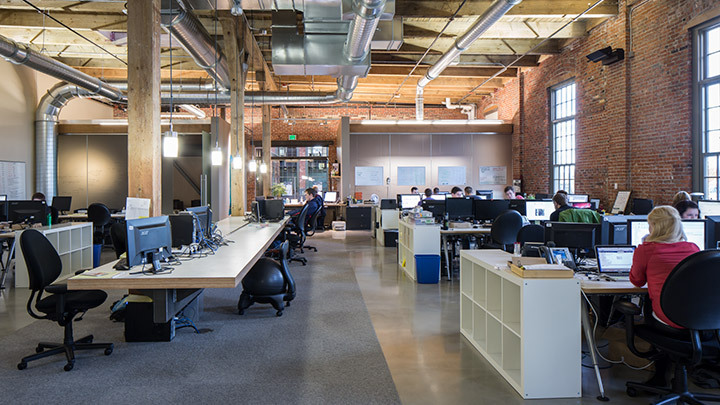 Most new companies are located in or near downtown and several large companies have setup major development centers in town recently. Now the high tech parks in the suburbs are starting to have quite a few vacancies. The number of young people getting drivers licenses and buying cars is shrinking. There are a lot of reasons for this. But people who can’t drive have trouble getting to the suburbs. People are having children later in life. Often putting it off until their late thirties or even forties. City cores are being re-vitalized. Even Calgary and Edmonton are trying to get urban sprawl under control. Real estate in the desirable high tech centers like San Francisco, Seattle or Vancouver is extremely expensive. Loft apartments downtown are often the way to go. Much more work is done at home and if coffee shops. This all makes living and working downtown much more preferable. It is also leading to people requiring less space and looking for more social interactions. To remain competitive a company like Sage needs to be able to hire younger people just finishing their education. We need the infusion of youth, energy and new ideas. If a company doesn’t get this then it will die. Right now the hiring market is very competitive. There is a lot of venture capital investment creating hot new companies, many existing companies are experiencing good growth and generally the percentage of the economy driven by high tech is growing. Another problem is that industries like construction, mining and oil are booming, often hiring people at very high wages before they even think about post-secondary education. What we are finding is that many young people don’t have cars, live downtown and are looking to work in a cool open office concept building. We are in the process of converting our offices to a more modern open office environment. We do allow people to work at home some days. Maybe we will even be able to move back downtown once the current lease expires? Or maybe we will need to create a satellite office downtown. Generally we have to become more involved with both the educational institutions by hiring co-op students and other interns. We need to participate in more activities of the local developer and educational community like the HTML500. We need to ensure that Sage is known to the students and that they consider it a good career path to embark on. Often hiring co-op students now can lead to regular full time employees later. Since Sage has been around for a long time and has a large solid customer base, we offer a stable work environment. You know you will receive your next pay check. Many startups run out of funding or otherwise go broke. Often while the job market is hot, young people don’t worry about this too much, but as you get into a mortgage, this can become more important. The times are changing and not only do our developers need to keep retraining and learning how to do things differently, but so do our facilities departments, IS departments and HR departments. Change is often scary, but it is also exciting and stops life from becoming boring. Personally, I would much rather work downtown (I already live there). I think I will be sad when I give up my office, but at the same time I don’t want to become the stereotypical old person yelling at the teenagers to get off my lawn. Overall I think I will prefer a more mobile way of working, not so tied to my particular current office.